Pileated woodpeckers – crow-sized birds with distinctive black and white coloration and red crests -- are native to United States woodlands. Spreading suet or hanging a suet feeder on the side of a tree will attract pileated woodpeckers and other native wild birds to your yard; especially in the colder months, when insects and other natural food sources diminish. Suet is a high-calorie food that gives birds the energy and insulation they need to survive the winter. Melt lard in a large saucepan over low heat. Remove the lard when it is fully melted and stir in the peanut butter, oatmeal, birdseed and dried fruit. 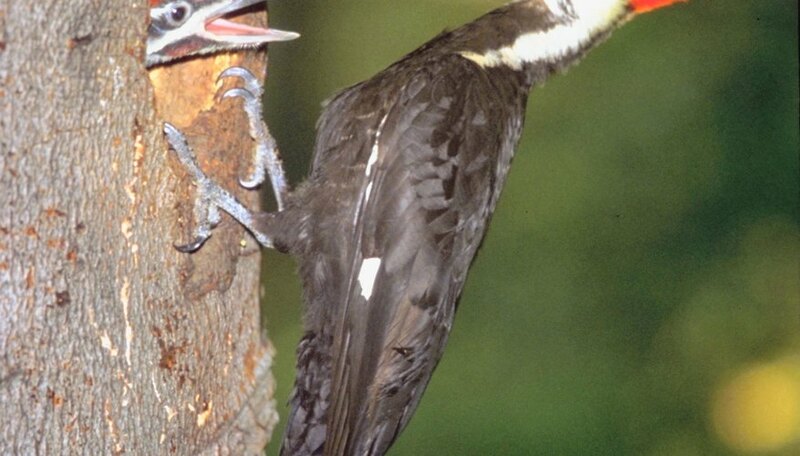 Paint the suet mixture directly on the side of a tree at least 10 feet above ground. If you prefer to use a suet feeder, you will need to cool the suet first. Pour the suet mixture into a square baking pan and wait for it to cool and solidify. Cut the suet into bricks and place one in a cage-style suet feeder. Attach the feeder to the tree and store remaining suet in the refrigerator. Suet may attract wild animals such as bears, raccoons and squirrels. If these animals are a problem, do not paint suet directly on a tree. Instead, install a predator baffle on a hanging suet feeder and take it inside overnight. Suet can spoil if left outside in warm weather. Sloane, Christina. "How to Attract Pileated Woodpeckers With Suet on the Side of a Tree." Sciencing, https://sciencing.com/attract-woodpeckers-suet-side-tree-8720676.html. 24 April 2017.